For the past few months I have been seeing our bollywood celebrities dressed up in their designer saree gowns. It could be for a movie promotion, award night, Tv show or during festivals they all wore saree gowns at one occasion or other. Saree gown is a pre- stitched saree which looks like a gown. 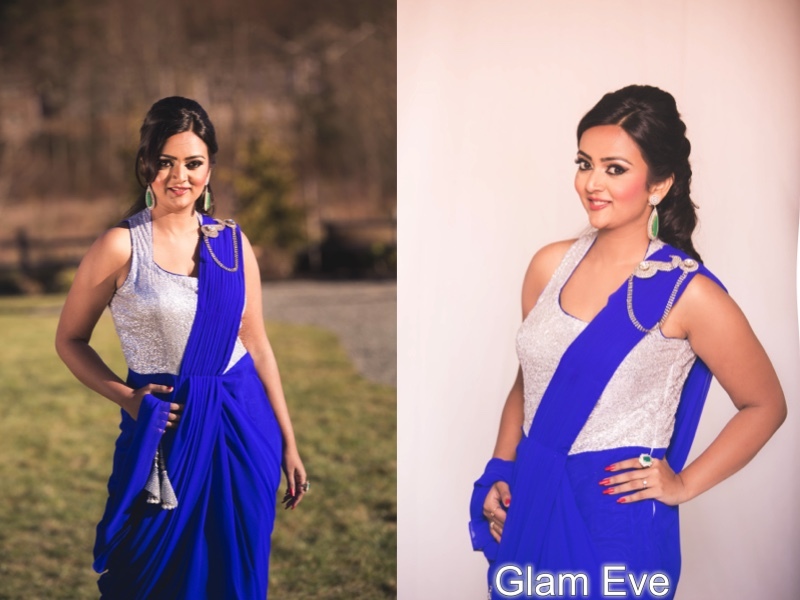 So you just slip into a gown with ease and flaunt the saree look effortlessly. I absolutely loved this new concept of saree gown and soon it was on my wish list. For a saree lover like me the saree gown had to look perfect. I saw few which looked neither like a saree nor a decent gown, it was not designed to blend in. After digging deeper I reached the conclusion that not all saree gowns match my taste and I need to be careful while selecting one. 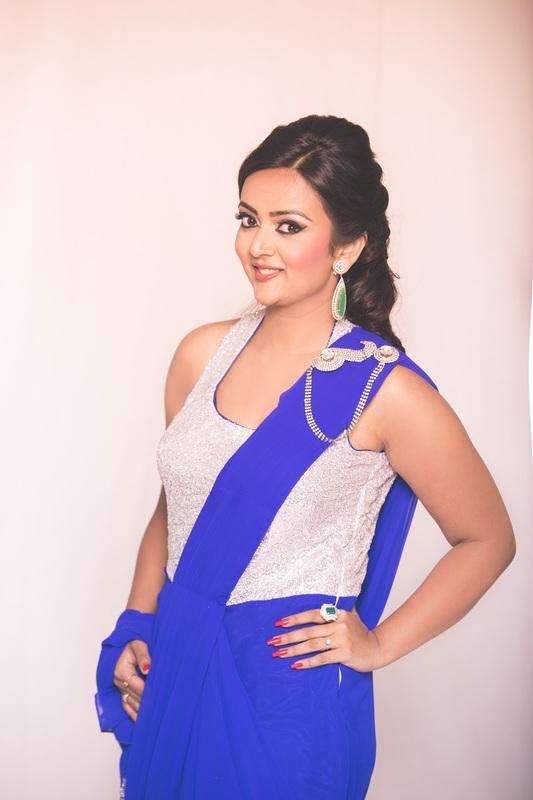 I was overwhelmed when I saw this royal blue saree gown for the first time at Glameve Fashion boutique. It was made in one of my favorite color- blue. It was a occasional wear with right amount of sequins and fortunately it wasn't over done. The skirt part of this gown had pleats which were beautiful extending from the waistline so it gave a unique look. The details on the shoulder added the bling elegantly. The latkans (hangings) at the end of the long pallu gave it a edgy look. I thought it was flawlessly perfect on the hanger. But I was skeptical to try it on. As I thought it might look bulky on me. I wasn't sure if it would or would not suit my body type. But fortunately Puja Sharma, the designer and owner of Glameve Fashion talked me into wearing it. And I am so grateful she did. She was so right, once I wore the gown and held the pallu it made me feel grand. 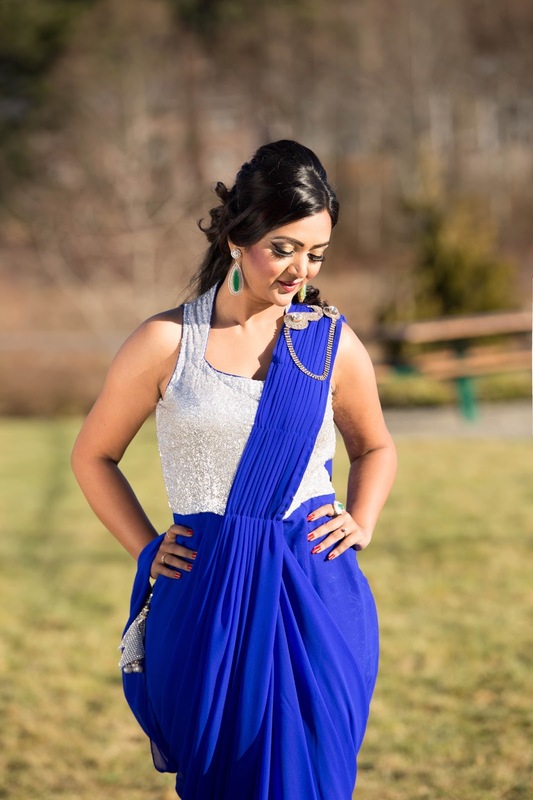 The chiffon material of the saree gown gave a beautiful shape to the dress supported by the satin under skirt. I absolutely loved it. Let me know what you think about this outfit in comments below. Glameve Fashion is seattle-based online boutique store and you can check out their website here- www.glameve.com . Its a boutique store, which specializes in custom made outfits and they ship all over USA, Canada and India. In addition to designer wear they also have a wide range of ready to ship items ranging from Sarees, gowns, lehenghas and accessories. They also provide consulting services and custom design options to individual customers so if you have any queries fell free to email them at support@ glameve.com. Here's the best part, Glameve Fashion is offering a 20% off COUPON to all Ananya Tales readers. Please do take a look at their website, if you know of anyone who is interested in ethnic fashion please do spread the word and share the coupon. Special Thanks to the AWESOME photographer Kiran Rai who always makes me look good. You look gorgeous.. The makeup & hair is perfect.. So beautiful Ananya..
That saree gown is so gorgeous, Ananya!! I love blue too. You look stunning in all the pictures! Love your make up and accessories too! I've seen a lot of them here and this one looks nice. Love how it looks like a sari and seems simpler to actually put on! Lovely colors! Ah! Sorry state of Sari? A crash course for beginners? The mysterious murder of ghoonghat? Awesome and packed with glamour. Are you related to one actress Mandakini? Similar eyes! what a stunning colour Ananya. The make up is so on point. U look like a bride to be. Ananya you looks mind-blowing. I like your style of dresses. You can buy online dresses from these website. Love Sarees ? Here are some beautiful and attractive Blouse Designs which you can get stitch for your self. Wow so nice!! What a lovely sarees. 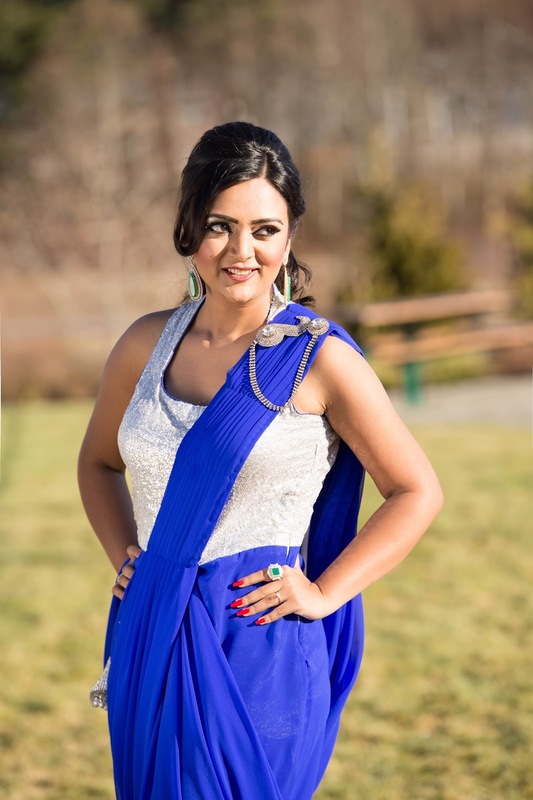 I love the blue sarees. I wants to buy best designer sarees to look better. Thank you so much for sharing. Great effort... superb organic content. If you are interested in COOL MEHNDI DESIGNS do have a look. wow, lovely saree..you are looking gorgeous in this saree..Color suits on you.. Very beautiful and now words. You are looking fabulous in saree. Great Post of saree related. I would love to see some more post like this.Keep posting like this.